Hi all and thank you for joining me today! Special thanks to the gracious and generous Mary Fish for sharing her blog and allowing me to show you a quick and easy tutorial to hold your mini coffee cups. 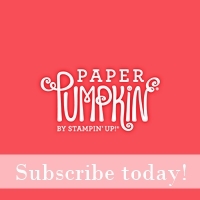 You've seen these little guys all over Pinterest and crafting blogs. The cups and lids can be purchased at www.webstaurantstore.com. Gather your friends, pool your resources and order in bulk! 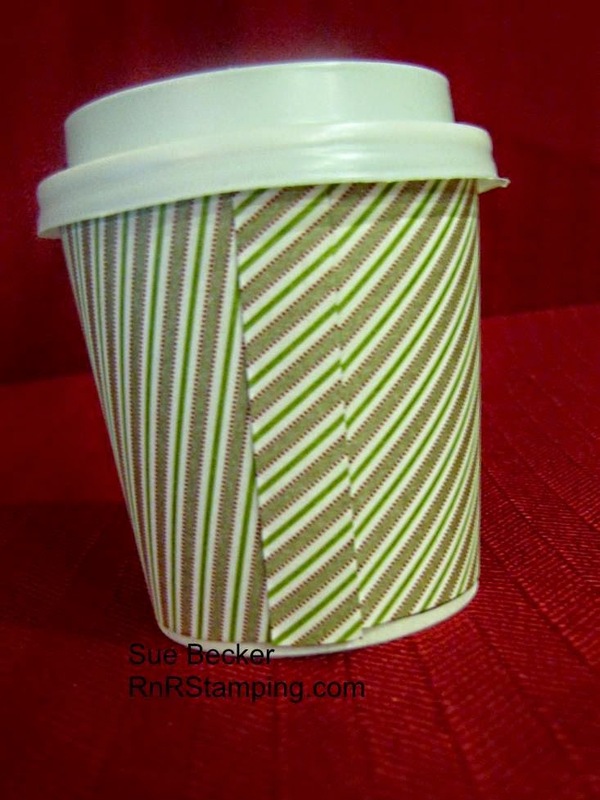 To cover your cup there are templates out there for you to copy, but I found it easiest to dismantle one of the cups and make a pattern from that. I did use DSP from my paper stacks and found that there was a small spot that wasn't covered due to the measurement of the paper stack. I simply used the leftover scrap to cut a 1/4" wide piece of matching DSP, adhered it over the seam using my Tombow glue and trimmed it to match the length of the wrapper. 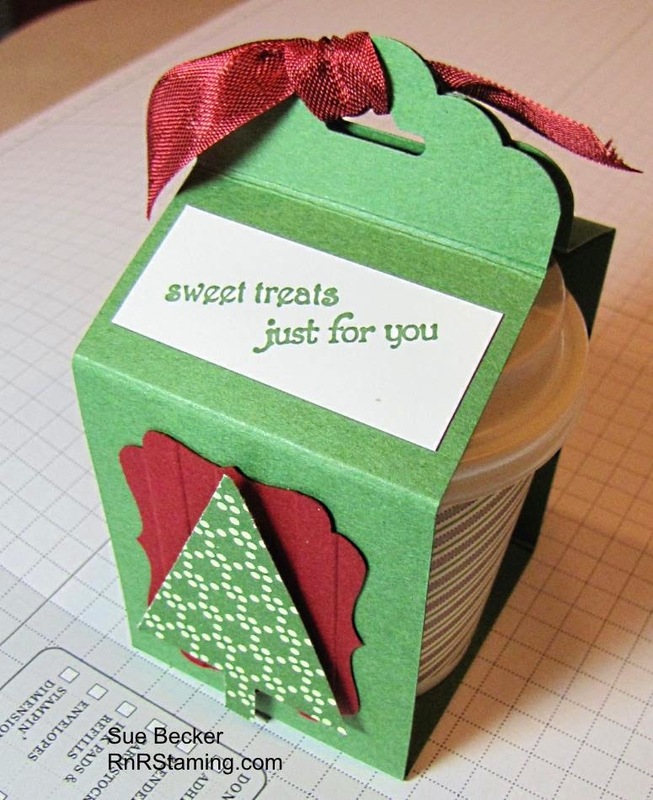 In preparing for seasonal craft fairs, I was looking for a way to package my little minis that wouldn't take a lot of time or resources. 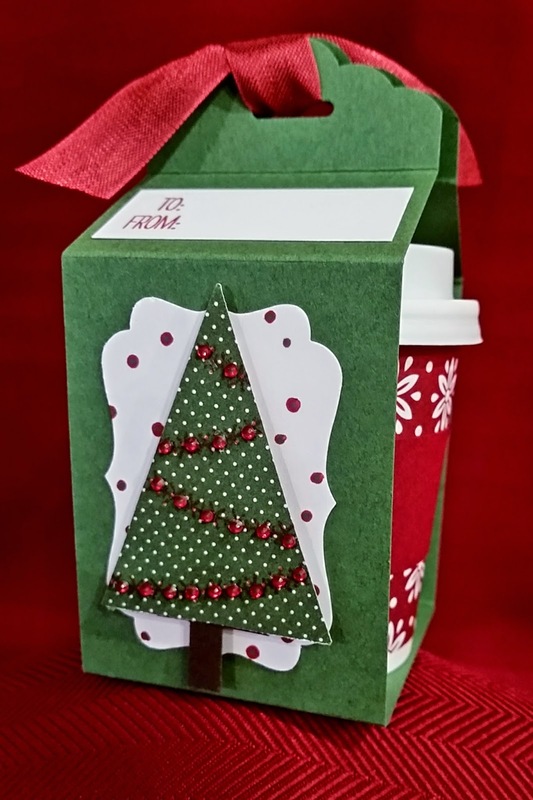 I sat with my steaming cup of coffee looking at the mini cup contemplating my stamping stash and came up with an idea that needs basic tools, card stock, your Scalloped Tag Topper punch and embellishments! 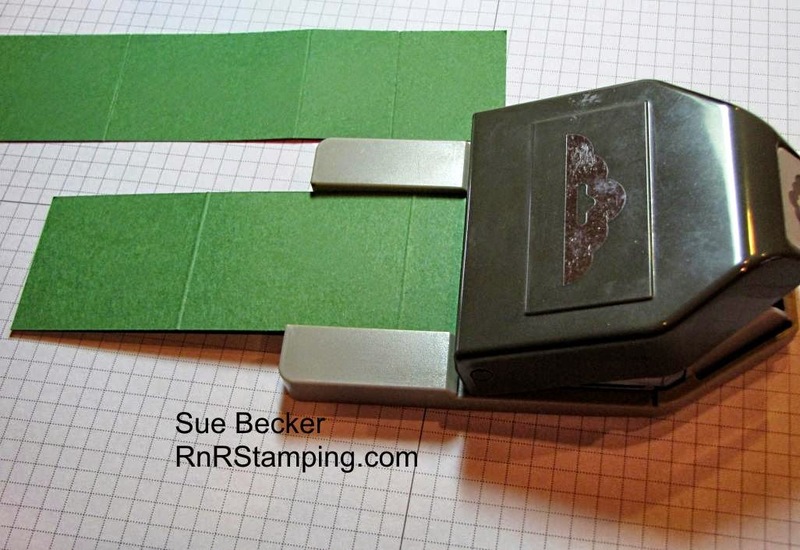 Your first step is to pull out your Stampin' Trimmer and your card stock of choice. 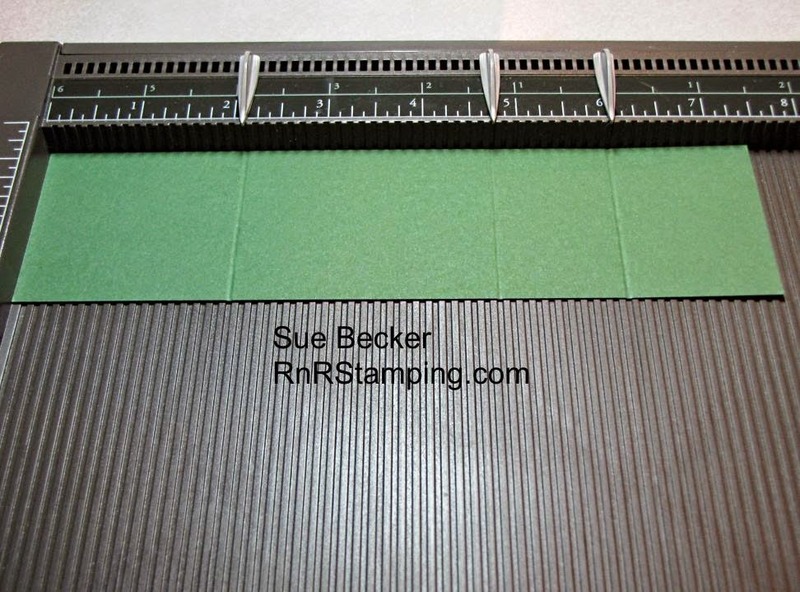 You will need 2 pieces of 2" x 7 1/2" CS. 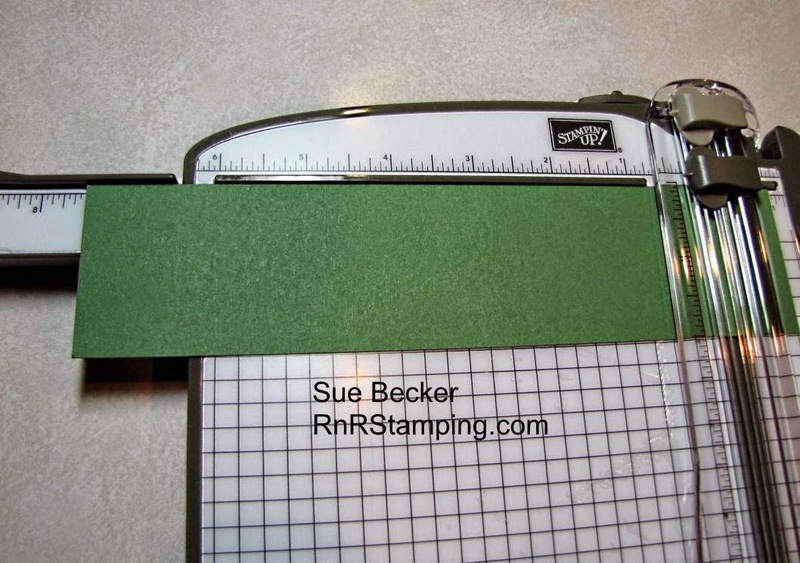 When cutting card stock for use with the Scalloped Tag Topper punch, I like to line it up just to the inside of the 2" mark. The CS will slip easily into the punch and you'll have no need for a 2nd cut. 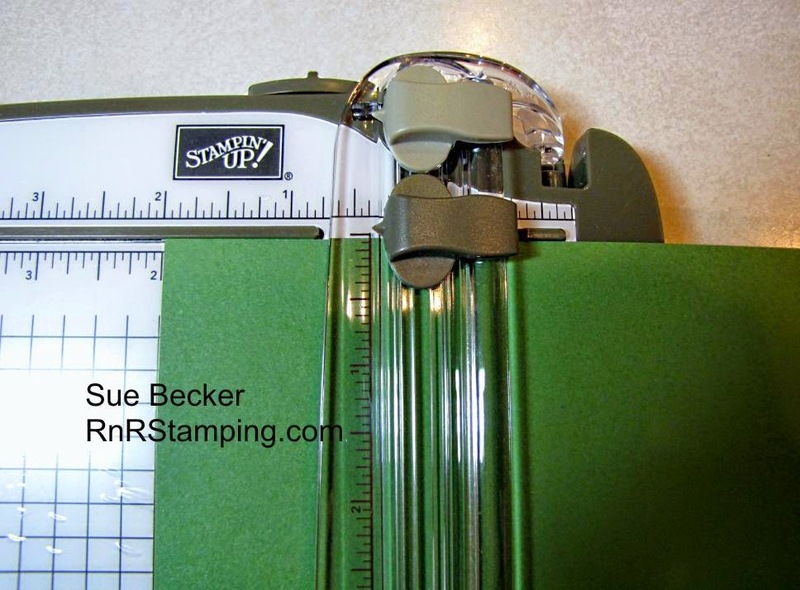 The extended arm on the Stampin' Trimmer includes measurements up to 14 1/2" and is designed to provide stability when cutting. It's not only a cutting tool, but also includes a scoring blade. 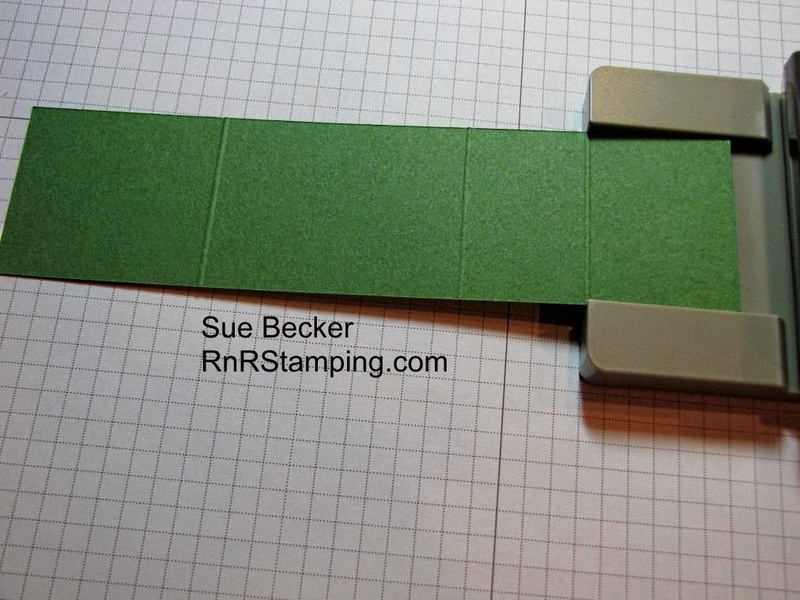 This is a definite must have tool for every stamper! 2 1/8", 4 3/4" and 6"
Once your pieces are punched, fold on the score lines so your pieces look like this. Add adhesive of choice, I used snail here, to the un-punched end of one of the pieces of CS. Adhere the two pieces together. It's as simple as that!! Now all that's left to do is to embellish your project and your imagination is your only limit! 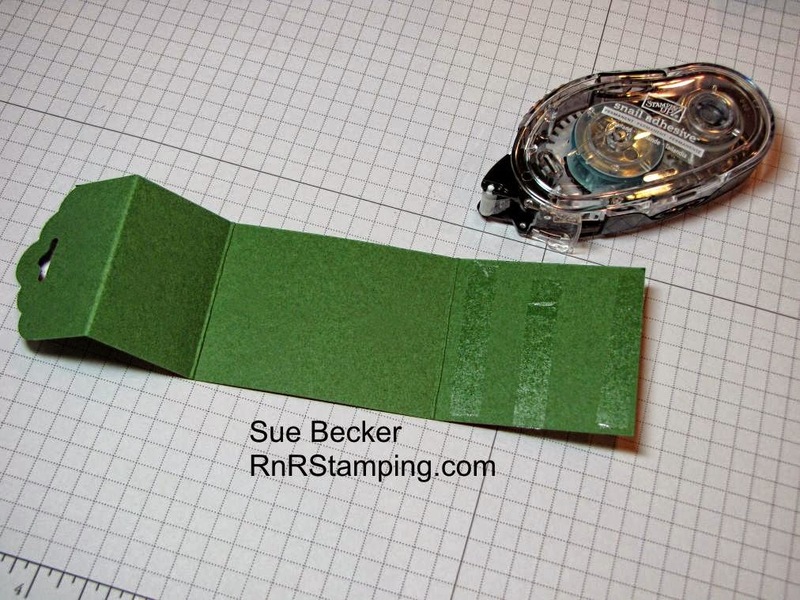 You can see in the photo below that I embossed some of the holders. I did add a small spot of snail right under the opening for the ribbon to adhere the tag tops together to better secure the cup. I filled the cups with Hershey kisses and some of the them with Coffee Nips. These were a big hit at my vendor event last week. 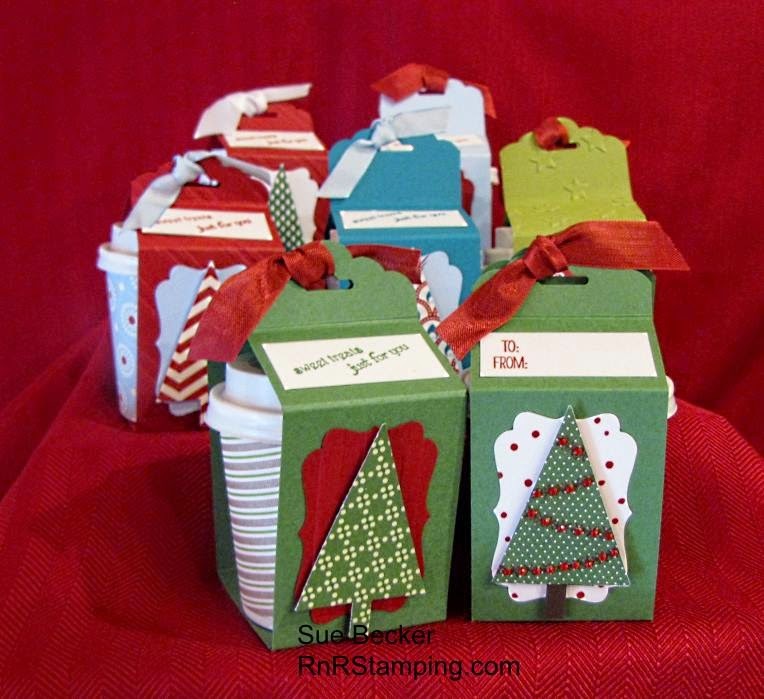 They make a great little gift that is fast, easy and pretty darn cute if I have to say so myself! So, what do you think? Please leave a comment at the end of this post. I'll look forward to answering your questions and reading your comments. To purchase any products used in this tutorial, click here. SUper cute, great tutorial! TFS! Thanks so much, needed this, as I have cups ready to cozy-up in a little holder. Have a joy filled day and again thanks for sharing. I have a goal of doing a video, but I'm not there yet! Thanks for your comment. This is absolutely darling! 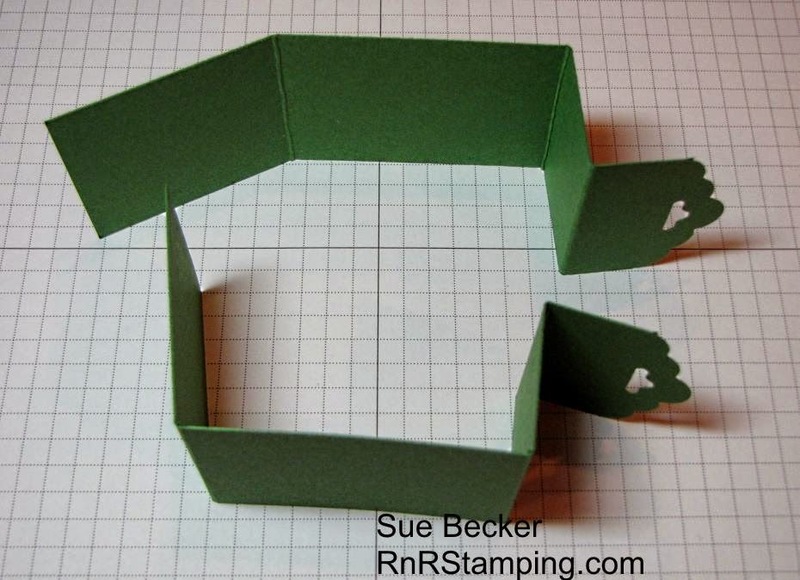 Thanks so much for sharing your tutorial -- I'm going to be using this! These are adorable! Thanks for sharing your cute idea! So cute! Great tutorial! Pinning it! Thank you so much! Such a fun project. What size of cup and lid did you use? Thank you for your comments! I'm happy to hear you like this project. I'll figure out video tutorials at some point! Karen, the cups I used are 4 oz with the lids to match. 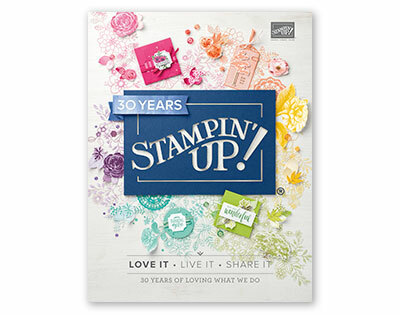 What a fun and fairly simple craft with a big wow! Thank you for sharing! 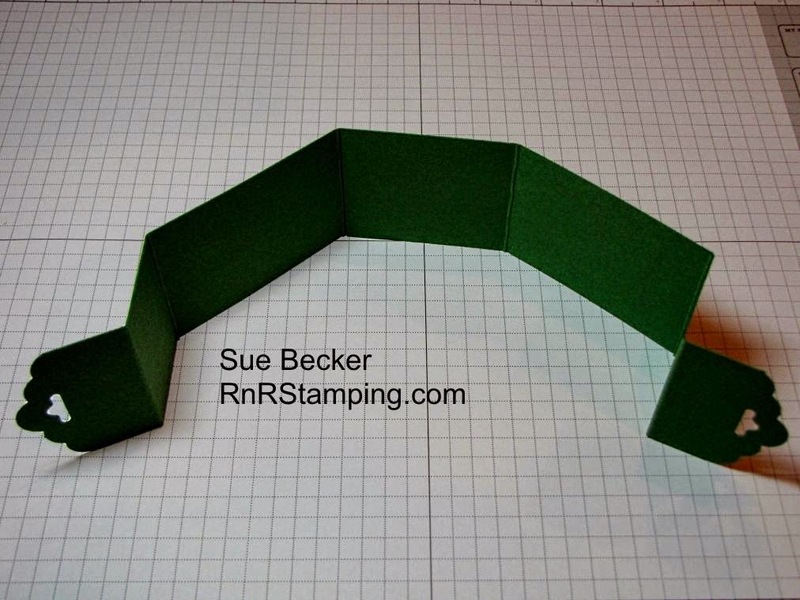 Thanks Sue- great pics for step by step how to and a nice, inexpensive gift idea! Glad they sold well for you! These are soooo cute and you did a super job on the tutorial. I made something similar to these last year for a craft show (the double pack with carrying tote) and they didn't sell well. I'm thinking I charged too much. May I ask how much you charged since I have 2 craft fairs coming up? Thank you! Cindy, I charged$4 or 2/$7. I also had Hershey nugget sleeves and Hershey kisses Christmas trees that customers could mix and match. The price all depends on your market. I'll have to come down on that. I was selling those cup totes for $6.00 and I think I sold 2. When it comes to craft shows, people around here just don't want to spend their money. They come out in droves, but if it's not a buck or two, forget it. I'm going to give these a try at $3.50, so I'll see how it goes. Thanks very much for getting back with me! I love, love, love your holder! I have done many cups, but this is so cute and easy. And.....I don't have to fuss so much on decorating the cups either! WOW! Thanks for sharing! You are most welcome Diane. Sharing time savers at this time of year is appreciated by all of us! Thanks for sharing Sue. I just started decorating and selling these cups in my craft fair both. I haven't done a holder yet though. I really like how yours are put together though. Simple and not to time consuming. I'll have to give it a try when I put some more together in the next few weeks. Jennifer, the craft fair queen, you'll have to let me know how they sell. Thanks for the comment! Thank you for sharing this with us Sue! Let us know the success of these at your craft fairs and how much you asked for them! Ruthie, I charged $4 or 2/$7. I also had Hershey nugget trays and Hershey kiss trees so folks could mix and match. They sold well, but pricing all depends on your market. Thanks for visiting my blog - come back soon! Love this project! thank you for sharing!!! You are most welcome MaryJo. Thanks for visiting my blog. Great cup holder. Thanks for sharing. Love these - thanks for the tutorial! Fantastic Sue!!!! Thank you so much for the share!